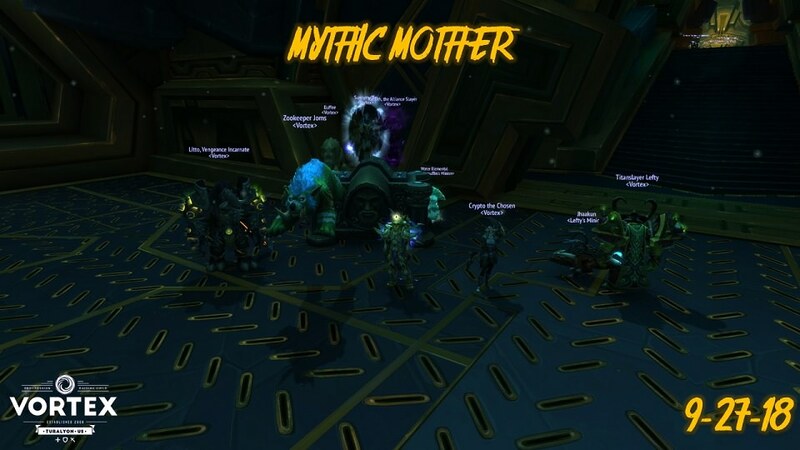 Fresh on the heels of our successes against Heroic G'huun and our reclear of Mythic Taloc, Vortex took on the second challenge of the Mythic Uldir raid: the Matron of Tenacity, Herald of Endless Research (M.O.T.H.E.R., henceforth referred to as MOTHER). MOTHER is a Titan construct designed to keep Uldir from falling completely to the pervasive corruption threatening it, and so puts you through your paces as she tries to burn away all the germs inconsiderate raiders bring inside her living space. The fight is similar in nature to Heroic, except that when you move from room one to room two and from two to three, each role spawns specific adds DPS still spawn Remnants of Corruption, which have to be interrupted or stunned to stop their free casting, while the tanks crossing over the Defense Grid spawn Resistant Bacterium which buff the other spawns. The healers spawn Viral Contagion, which but a nasty debuff on players that has to be run out lest it spread. The timing and spacing is a bit tight, particularly for the third chamber, with the wall and ceiling lasers being very reminiscent of a scene from the first Resident Evil movie. Well done everyone! May our success continue with Xek'voz and the other bosses, and may Litto continue to get ridiculous amounts of BoE drops! Torque, love your titles for these posts. Top notch. waiting on a call to pick up my dog from groomer (she got out came back ugly, groomer couldn't take her till late)...guessed they'd be done by 7, still haven't called; latest was 8. should be back by 8:30.